The official Party game Bunco®. 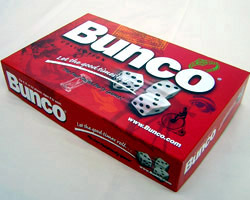 The game of BUNCO®. Americas official favorite dice game. The official Bunco® Game includes official Bunco Rules, Bunco Bell, BuncoTally Pads, Bunco Score Cards, Soft Die, and Nine Dice. The Bunco World Bunco enthusiasts are forming new OH BuncoFun groups daily. We thank you for loving our Bunco® game. Order your Bunco® Dice game and start your Bunco Group today. If you want the game of Bunco® with the Bunco® Boardgame please order 011880B which can be viewed and ordered from the homepage.